Fermenting and dry hopping under pressure has the potential to reduce ester production, flexibility to ferment at higher temperatures, and ability to trap dry hop oil compounds from being removed by carbon dioxide production. Landaud ultimately concluded that temperature had an accelerating effect on fermentation and dissolved carbon dioxide (increased top pressure) resulted decreased yeast and ester production rates likely by affecting the acetyl CoA production rate. In terms of fermentation time periods, the ester production rate increased slowly during the first hours and then fast at maximum fermentation rate. 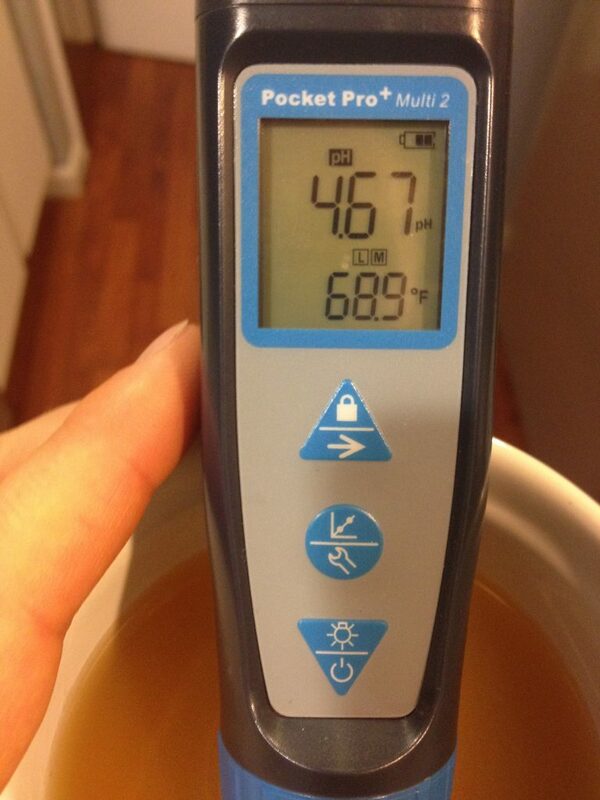 At the higher end of fermentation temperature (60ºF) no lag time was observed for yeast growth. It’s interesting to me to see that the Landaud study found fast and increased yeast growth at higher temperatures and less pressure. In addition, based off the visual charts in the study, it appears total ester production starts to really climb around 50 hours (and can still increase after 100 hours) into fermentation and total fusel alcohols around 24 hours into fermentation at the higher fermentation temperatures. This may suggest that if the fermented is uncapped (no top pressure applied) during the first 24 hours of fermentation and then capped with pressure applied, this may allow for more increased and faster yeast growth without experiencing unwanted esters or alcohols. Learning that esters are mainly formed during the vigorous phase of primary fermentation, it may be wise to not be so quick to the trigger in raising fermentation temperature to help finish out the ferment unless you are trying to get more esters from the beer.2 All yeast strains can behave differently, but in my experience this ramping of temperatures hasn’t been necessary to reach final gravity. For example, in one post I looked at 25 different beers fermented with WLP002 and ramping the fermentation temperature had a very weak relationship to the final gravity. Although the Landaud study was for beer fermented under pressure, seeing both ester and fusel alcohol formation climbing after 100 hours of fermentation (4+ days) makes me at the very least question this early ramping processes. Below is a chart I made summarizing their ester production findings against the taste thresholds for each. The chart ultimately shows that increased pressure reduced ester production despite higher fermentation temperatures. Continuing to work backwards with the studies on the issue, in 1984 it was again found that beer in unagitated ferments under 28 psi (immediately pumped to pressure after filling the fermenter) had slowed ethanol production, reduced final concentration of fusel oils, reduced yeast growth and increased final pH. They also found a distinct increase in the speed of fermentation (so did the Landaud study). Interestingly, they also found that the beer’s fermenting under pressure had less yeast cells in suspension during fermentation, which they attributed to slow absorption of the vicinal diketones towards the end of fermentation in the pressure fermented beers.4 The increase in the beer’s final pH found in this study is interesting as previous research has shown that higher pH in hoppy/bitter beers can result in an increase in bitterness perception. Less yeast cells in suspension is also interesting, I’m curious how fermenting and dry hopping under pressure will impact the clarity and taste of a New England style IPA with research suggesting that more yeast cells in suspension could result in more hop oils in the finished beer. The reduction of vicinal diketones (VDK), diacetyl and pentanedione, and their precursors by yeast during fermentation of beer and one of the main considerations that dictate how long a beer should be aged.5 So you can see the increase in VDK during fermentation in the beers under pressure is not considered a benefit. However, looking at the fermentation temperature, it appears this is more of a concern with lager yeast strains and maybe not as much of an issue with ale ferments. I like to dry hop early in fermentation while the yeast are still present and active, which allows any oxygen that was introduced by the dry hop process to be metabolized by the yeast before it causing any oxidation the beer.18 Dry hopping early may also help enhance biotransformation of the hops. The downside however to dry hopping early gets to the last point above, that the active fermentation may be striping out these wanted compounds through our airlock! I can attest to this fact, after adding dry hops around 3-5 days into fermentation, I usually come back a few days later to check on things and as soon as I open the fermentation fridge I get hit with a big tropical fruit aromas. So it seems to make sense to experiment with dry hopping under pressure in an attempt to trap or keep the wanted hop compounds contained in the fermentation vessel rather than allowing them to escape. Using the information from the research above, I brewed a hop forward NEIPA to see how my results would compare to the more traditional methods of fermenting and dry hopping. For the yeast I went with top cropped RVA Manchester Ale, both because I really enjoy the beer it produces, but also because in past brews I have noticed a bit of a vanilla richness in the aroma and taste coming from the strain. I’m interested to see how this yeast derived characteristic comes out in a beer fermented under pressure (which should decrease ester formation). To test out the claims on higher fermentation temperatures allowed when fermenting under pressure, I didn’t give this beer any temperature control. The average temperature this beer sat at during fermentation was around 78F, which is about 10-12 degrees higher than I have gone with the strain in the past. Fermenting at 20 PSI at almost 80F. When I brewed this beer I split the batch into two 5 gallon fermenters and fermented one with London Ale III 1318 at a constant 65F throughout the entire ferment (no ramping of temperatures at all with this beer). The London Ale III beer was a re-brew for the American IPA category for the final round of the National Homebrew Competition so I didn’t really play with the recipe much. Both beers had the same recipe I used prior with the only difference being that the pressure fermented beer only had 10 grams each of Citra/Galaxy in the keg until it kicked versus 40 grams of each in the keg for the competition IPA (slightly different than the original recipe). In addition to the different yeast strains (although both Boddingtonish strains) the London Ale III beer also had a pre-fermentation addition of 15 grams of Galaxy. I was hoping the pressurized dry hop would result in needing less total hops in the keg. Using a spunding valve, I fermented the beer at 20 PSI, which despite the higher fermentation temperature should reduce the ester formation quite a bit based on the literature above. To try to take advantage the reduced lag time stemming from higher fermentation temperatures (as well as evidence from above that reduced pressure increases yeast growth) I had no top pressure on the keg for the first 24 hours of fermentation. After 24 hours of fermentation, I hooked the 10 gallon keg, fermenting approximately 5.5 gallons of wort, up to my C02 tank and filled to 20 PSI. I then attached the spunding valve and dialed it down until I started to hear a hiss of C02 escaping to keep the keg at a constant 20 PSI. 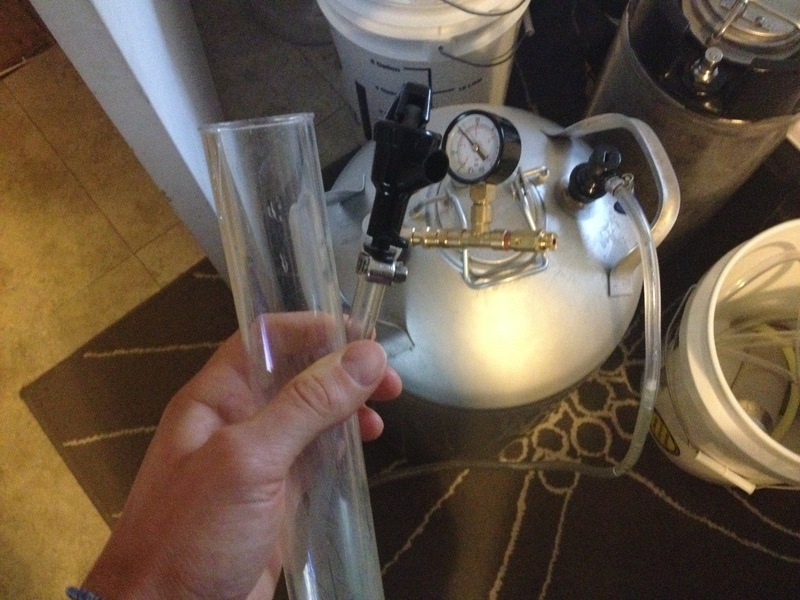 I chose to cut the diptube in the keg high enough to sit above the cold crashed yeast and hops to then transfer the beer to the serving keg with C02 and without siphoning, which eliminates the chance of oxygen pickup during the transfer (picture below). However, it didn’t work as well as planned. The dry hops didn’t settle out to the bottom like I was hoping after just a few days crashing around 40F. For future beers I ferment in the keg like this, I’m going to add my stainless steel filter to the diptube when I dry hop to help eliminate any floating hop particles and yeast from getting into the serving keg (like the tweet below). This method would have also allowed me to not cut as much from the dip tube. Taking gravity readings during fermentation with no chance of oxygen entering the fermenter is nice. Just hook up a picnic tap to your liquid out post! On day five of fermentation (gravity at 1.020) I released the pressure from the keg and dumped in the first dose of dry hops (56 grams Citra and 28 grams Galaxy). 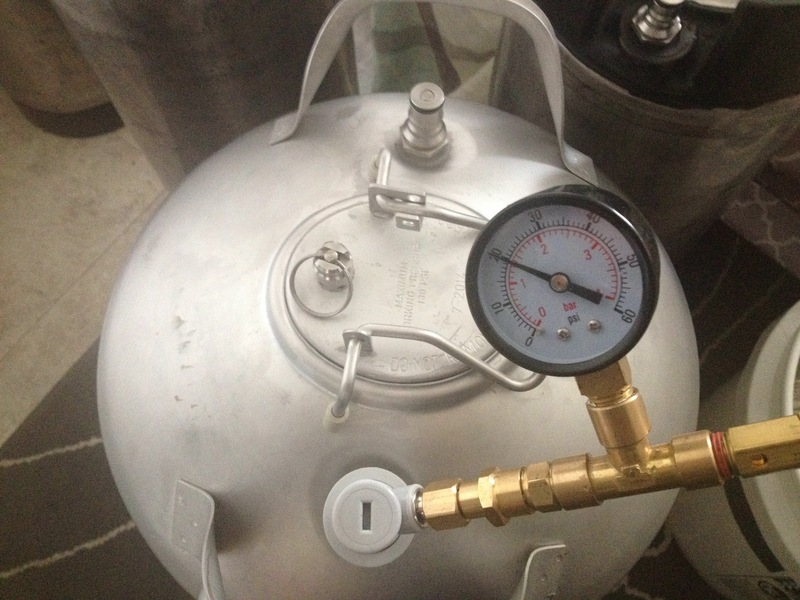 Rather than immediately filling the keg back up to 20 PSI at this point, I only filled the keg to 5 PSI to seal the lid and cranked up the spunding valve pressure to past 30 PSI. The idea here is during the last bit of fermentation with the dry hops all of the carbon dioxide produced will remain in the keg to try to trap the wanted hop compounds and C02. As the beer goes from 1.020 to its final gravity, all the naturally created carbon dioxide remains in the keg and in the beer for natural carbonation! Using a fermentation chart, I saw that at the fermentation temperature of 78F I would need a PSI of around 30 PSI on the beer for proper carbonation, which is why I had the spunding valve set to 30 PSI. I was hoping not to hit this level (30PSI) because going past it would allow some of the C02 to escape through the valve, along with hop oil compounds. Luckily I succeeded in not capping fermentation too early as the C02 stopped building when the valve reached 28 PSI. 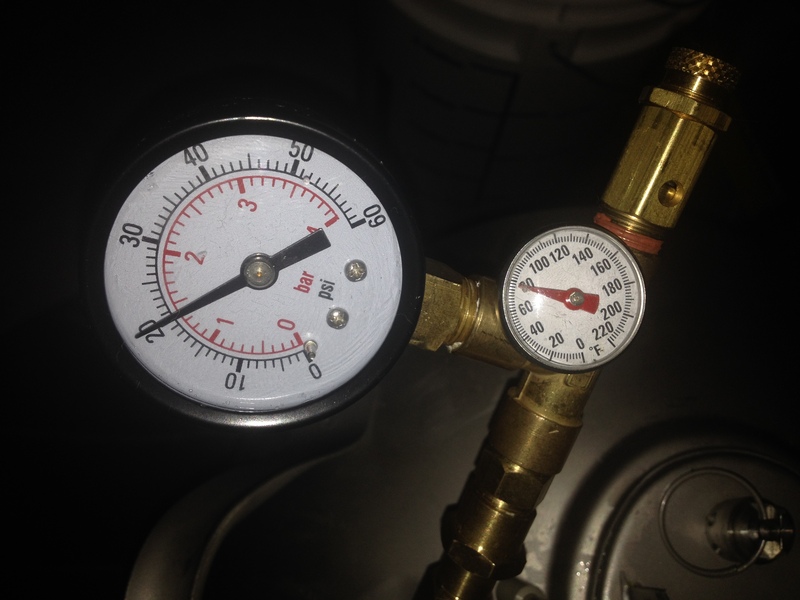 It’s easy to see when the beer is completely done fermenting with this method because the pressure gauge will stop increasing, which is also nice perk! The natural carbonation was just under where I wanted it, but after a few days on gas at serving pressure, it was ready to drink. Despite looking somewhat clear prior to dry hopping (although the shape of the hydrometer helps with this), it definitely ended up being a cloudy typical NEIPA. As you can see from the picture below, the haze really increased after dry hopping. I was curious how the haze would be with this beer because the literature suggested that beers fermented under pressure had less yeast cells in suspension during fermentation. In this case, the clarity for the strain progressed like I’m used to with no pressure ferments and heavy dry hopping. Sample of the beer about 5 days into fermentation (prior to dry hopping). Comparing this beer to the cooler London Ale III beer, it’s just not at the same level. The London Ale III beer pops with big fresh hop flavors and aroma where the pressurized ferment is less exciting, slightly muted. The vanilla like esters I’ve gotten with this RVA strain in the past are definitely less if not there at all. Likewise, I don’t get any hot alcohols or any noticeable negative flavors from the hot fermentation, which would seem to agree with the research that the top pressure with increased fermentation temperatures can both reduce esters and alcohols. In fact, I can actually detect slightly more alcohol in the aroma of the cooler London Ale III beer (but this is slight). I was hoping to see a bigger impact in terms of hop aroma with the closed dry hop. Because the hops didn’t settle out during the cold crash period and clogged during the transfer to the serving keg, I did have to release the pressure on the keg and add the sanitized filter then re-pressure and then transfer. This was unfortunate as I was really hoping to keep all the aromas in the keg. However, the London Ale III beer was never under pressure and had a bigger hop aroma (with more hops in the keg) so I’m not sure what sort of impact releasing all the pressure from the keg actually had. Further ferments with this method should help clarify this. On a similar note, I used to carbonate my hoppy beers with the high pressure (30-40 psi) for a few days than release it to serving pressure, but have since moved to carbonation stones to avoid this massive release of pressure. I don’t have any data suggesting that this release is taking hop aroma with it, but if you can smell hops during the release that’s enough for me to avoid it! Aroma differences between the two beers are fairly drastic the pressure fermented beer has distinct orange juice/peel aroma with and floral characteristic that almost borders a little centennial like. Overall the pressure fermented beer aroma is more subdued in terms of intensity and fades rather quickly. The cooler London Ale III beer is extremely inviting (and big time apparent) with more of a soft sweet overly ripe fruit character of strawberries and raspberries with a bit of peach that all comes together to resemble a handful of sweet jelly beans. The flavor of the pressure fermented beer is lacking, overall it’s kind of boring. Maybe this lack of flavor is in part due to the high final beer pH of the pressure ferment (I couldn’t find any research to explain this). Another one of the biggest differences between the pressure fermented beer and the London Ale III beer is the mouthfeel despite only being one gravity point higher (1.015 to 1.1014). The pressurized ferment beer has a bigger and creamier mouthfeel that makes the beer feel much bigger than it is. One possible explanation for this difference is that glycerol production can be increased with raising fermentation temperatures 19 In previous research on glycerol production I came across data that suggest increased osmotic stress on yeast might also increase glycerol production (although this was for high gravity beers and not pressurized ferment beers). Overall, there is no question I prefer the cooler fermented London Ale III beer with no top pressure, but for a beer that fermented near 80 degrees with a yeast strain that (for me at least) usually produces noticeable esters, I’m intrigued by the process! The higher final beer pH, thicker mouthfeel, low alcohols and esters despite the fermentation temperature definitely seem to have potential depending on what your intended results are. I’m anxious to try a combination of a cool non-pressure ferment with capping of the fermenter immediately after adding the first dose of dry hop in a future hop forward beer. I’ve used London Ale III now in a number of beers and this was by far my favorite which I think is in part to the cooler fermentation temperature (constant 65F). I’ve noticed before a grainy quality with London Ale III that bordered on peppery when I would ferment around 68F and even higher when ramping the temperature towards the middle of fermentation. I may even try this strain a tad lower, 63-64F (which would be the very low end of the recommended temperatures from Wyeast). I should have gotten a spunding valve about 3 empty c02 tanks ago (or built one like this). I love being able to hook up the valve to newly filled keg and leave the spunding valve on for a few hours to make sure there are no leaks. Putting the spunding valve on kegs that are aging is also a bonus if you ever worry about them not keeping their seal. Pre-fermentation additions of Galaxy in the London Ale III beer (I chose this for its higher total oil content vs. Citra) seems to be working out extremely well for me. I may have to try to experiment with more at this phase vs. the steep/whirlpool addition. I’m brewing two NEIPAs to serve with the DC Homebrewer’s Club at Homebrew Con in Baltimore on Thursday night, stop by! K.UMADA, J., NAKAJIMA, S., TAKAHASH1, T., and NARZ1SS, L. Eur. Brew. Conv., Proc. Congr. 15th, Nice, 1975, p. 615. M1EDANER, H., NARZISS, L.,and WOERNER, G. Brauwiss.27(8):20(1974).7NORSTEDT, C., BENGTSSON, A., BENNET, P., LINDSTROM,L., and ARAPAA, 1975, p.581. TSANKOVA, E., KOSTOV, V., and GORANOV, N. Khranit Prom-st.24(5):24(\975). Kaltner, D.; Mitter, W. The influence of hops upon the aroma and taste of beer. Scand. Brew. Rev 2003. If you let CO2 slip from a carbonated beer you also let a lot of hop aromas out. (at least this is my experience with this process). Nice write-up btw! Hi, the higher ph on the pressure fermented batch was interesting. I have heard & read about dry hopping at higher levels increasing the ph, & have always limited my own to 6oz. or less for 5.5 gal. I have found these links below interesting. The advice Gordon Strong give’s is the only one I have found to remedy the higher ph in a heavily dry hopped beer, though I have not yet tried it myself. Thanks for the links! I actually don’t mind (and aim for) a slightly higher finishing pH in these beers, even as high as 4.55. I tested Tree House Brewing Julius and it was fairly high with a 4.47 pH and it’s a great example of the style. This is of course to my palate though. If you upped the hops on the pressurized batch do you think it’d be a closer comparison? I don’t think so, it was so different. The pressure definitely has an impact, in this case almost muted the beer. I’m not sure if I missed it, but what do you mean by “pre-fermentation addition”? I first thought you were referring to whirlpool, but then later you state that you’d like to compare pre-fermentation to steep/whirlpool addition. Are you adding hops after cooling, but before hop addition? Pre-fermentation addition is adding hops to your fermenter prior to even adding your wort, so you are essentially dry hopping your beer from day one. Interesting! I assume you may have inferred that I meant “…, but before *yeast* addition?” in my post. I have a NEIPA planned for this weekend, and now I’m considering moving part of my whirlpool addition to pre-fermentation. 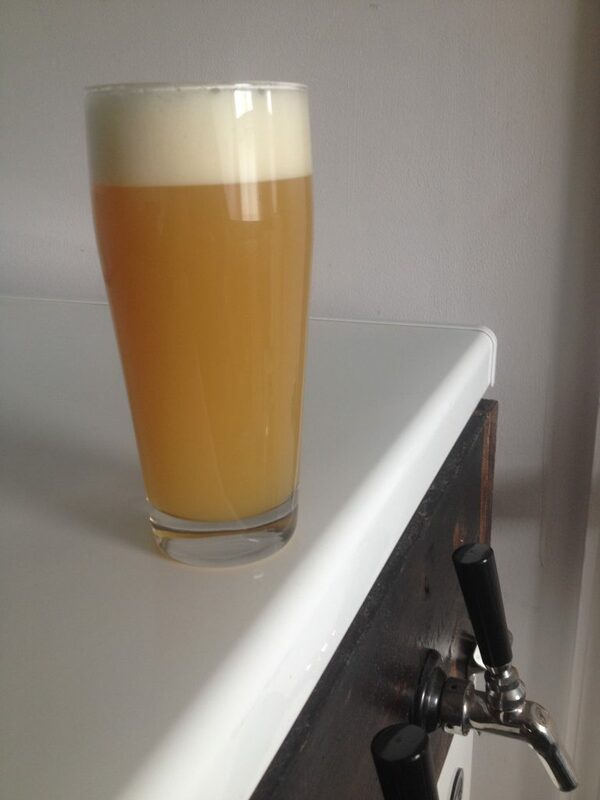 I see your hybrid lager session NEIPA uses both techniques, is one technique vs the other something you are investigating, or do you find using both gives the best results? Yup, before the wort and yeast is added to the fermenter. I like the results so far and I don’t see a downside (yet) of adding hops, even in small amounts, at every chance you get! I haven’t experienced any fermentation issues with the hops in right away either, I’ve harvested (top-cropped) some of these beers to without issues as well. Have you brewed this beer before in a non pressurized vessel? I’m wondering if you would get the same low aroma and flavor in a different vessel. I keep researching pressurized fermentation. I really want to try it but it seems every article, just like this one, has a negative affect on the beer. I have tried similar recipes in a non-pressureized vessel and did like the results more. My guess is the reduction in esters and alcohols from the top pressure put the final levels below or close to their thresholds resulting in a milder flavored beer. Esters and alcohols play a role in beer flavor and with the RVA yeast strain, I really enjoy the ester profile I get with it. For now I think it’s best to experiment with just dry-hopping under pressure towards the tail end of fermentation. I am planning to make this approach, start fermentation with cold temperature and dry hop under pressure at the end of the fermentation. Knowing the terminal gravity of the beer, at what gravity points do you suggest to spund and dry hop?. I am not sure the reason you decide to dry hop at 1.020. 1.020 just happened to be what the gravity was at on day 5 when took a reading and decided to dry hop. I’ve tried spunding on the tail end of fermentation a few more times and I’d suggest against it actually. I’ve never been thrilled with my results, I always seem to get a milder flavored beer from it. I’m having more success dry hopping early into fermentation with an airlock (or however you typically do it) then after fermentation is over or almost done, doing another small dry hop addition for a day or two. Then kegging at this point (maybe with some more hops). Interesting! that is what i will do. Do you prefer adding you hops early into fermentation rather than whirlpool? 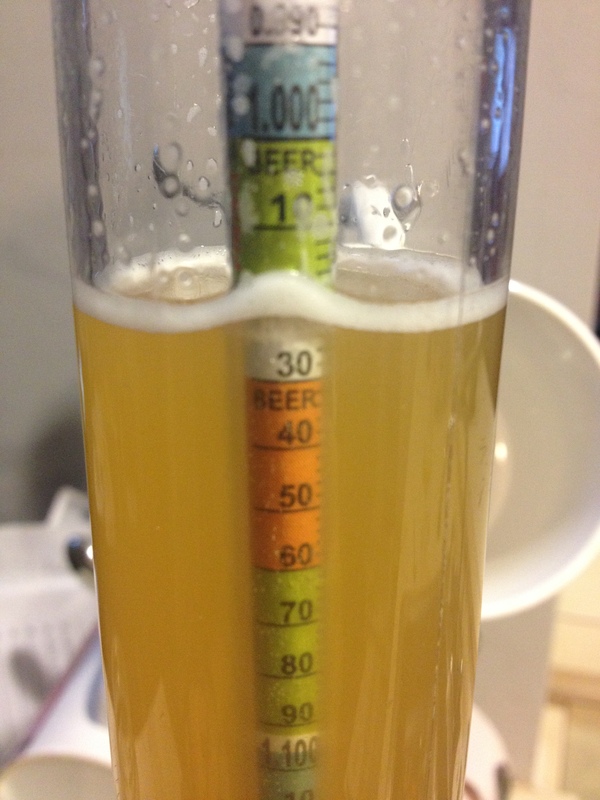 I ferment at 31psi about 2.2bar. I find that the final result is properly carbonated. Then when I counter pressure transfer to the dispensing keg i put the spunding valve on the dispensing keg to ease the counter pressure transfer process. To dry hop I use a fine mesh stainless steel tea ball. It is left in the dispensing keg till the end. I suspend it half way in the keg using a chain attached to the keg lid. Both! I think there are benefits from adding the hops during the hot-side that you can’t get at fermentation temperatures. Nice comparison. Im looking at getting into PF and this was interesting. I have to ask but, why you have done an experiment with 2 different beers? The hop aroma and mouthfeel could be completely different due to yeasts, recipe, ferment temp etc. The basis of any experiment is to change one variable and keep the rest constant so you can see what that variable brings to the table. It is incorrect to assume that the hop aroma, or lack of, in the pressure ferment is due to the pressure when there are a multitude of differences in the process and the product. I agree that’s the proper way to run an experiment, but in this case I split the batch because I needed to re-brew a beer for the final round of the National Homebrew Competition, so it wasn’t really for experimental purposes, more of a fun side-by-side compare. Hi Scott. Do have a source for the dip tube screen that you used? Was the comparison beer carbonated when you took the PH reading for comparison? If not, that would explain the PH as fermenting under pressure is carbonating the beer which causes it to become more acidic. The other beer fermented in an open pressure vessel will not carbonate and thus have a higher PH. Ahh sorry see you had a HIGH Ph. Odd. As this is quite an old thread, have you tried any more pressure fermentation at the regular temp? If so did it improve the flavor and aroma? Hey John, I’ve done a few beers where I cap the fermentation towards the tail end of fermentation with the last dose of dry hops essentially allowing the beer to naturally carbonate. Each time I’ve tried this, however, I wasn’t thrilled with the result. Thinking I would trap in more of the hop aromatics (not being vented with C02 under pressure) and increase aroma, I actually seemed to get the opposite, a more muted hop character with a “green” note. I’m not sure if I’m also trapping in some of the undesirable components of fermentation or what, but experimenting with this method a few times and getting the same result, I’m leaning against the processes. If anybody else is doing this with success, I’d love to hear about it! Hi Scott, thanks for the info. It’s not really what I wanted to hear as I am about to purchase a couple of William Warne pressure fermenters! I would love to hear any of your other readers who may have experimented with pressure fermentation, especially if they are getting that muted hop character and ‘green note’. If you have any more links to articles on pressure fermenting I would be really interested in having a read. There is a fair amount of experimenting going on over here in NZ but but I have not been able to find much info on pressure fermenting other than what the Williams Warne guys put out – they are keen of course! Love your blogs Scott, I’ve got a shortcut to your site on my home page! What about fermenting at medium pressure. Like 15 psi? And normal temp range for the yeast? Perhaps that strikes a balance for the NEIPA on all levels? Everything is worth a try! I haven’t been too happy with my pressure ferments, perhaps too much ester suppression? I’m more intrigued with capping very late, with just a few points remaining with the last dry hop charge. Hi, I’m very interested in your experiment. research suggesting that dry hopping too much leads to a grassy flavor, because citrus flavor saturates earlier. Maybe the saturation point(the amount of hop to be used) has become earlier due to pressure. So I think you may try adding less hops than your recipe under no pressure.